Asbestos is a naturally occurring mineral used in the building industry because of its strength, resistance to fire and effectiveness as an insulator. It was also used in newly popular textured paints, creating an interesting rippled effect on ceilings and walls. 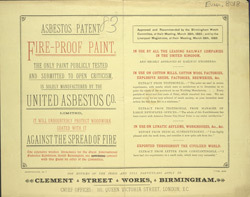 This leaflet highlights its use of fire proof-paint in lunatic asylums and workhouses. In the 1980s asbestos was linked to a variety of lung disorders and is no longer used in building or decorating materials.